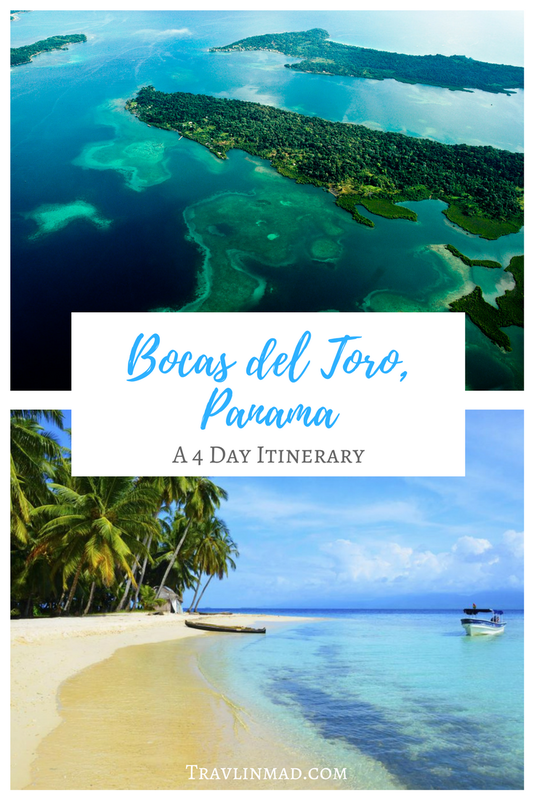 Like a treasure trove of shimmering jewels, the captivating Bocas del Toro archipelago dots the beautiful turquoise waters off the Caribbean coast of Panama. These waters and the coral reef surrounding it with an amazing array of sea life makes the islands and its main hub of activity, Bocas Town, a favorite destination for scuba diving and snorkeling. But you don't have to be a diver to enjoy Bocas del Toro. If you just want to get away and find the beaches and sun of the tropics calling to you, Bocas del Toro has one of the best laid-back vibes we've experienced and should be on your bucket list. We combined Bocas with our trip to Caribbean Costa Rica - a great combo - but there are enough things to do in Bocas del Toro to make it a perfect destination on its own. Flights leaving the US from major airports like Los Angeles, Chicago, Kennedy, and Atlanta, most often connect through Panama City, Mexico City, Cancun, or San Jose, Costa Rica. Most flights leaving Europe will first connect through Los Angeles or Dulles in the US before connecting through Panama City or Mexico City. As we were also traveling to Costa Rica, this side trip was an easy one-hour flight from San Jose to Bocas del Toro. The flight from Costa Rica to Panama is incredibly scenic as the rugged mountains and lush forests of Costa Rica give way to bright green islands floating in the azure waters of Bocas del Toro. Don't piss off the Customs guy! Flying into Bocas from San Jose avoids the customs and immigration hassles you may encounter with ground transportation at the border crossing. As of this writing you can't take a rental car across the border, and depending on the time of day, there can be several busloads of people arriving at the same time making for a very long queue. The airport is only 1.5km from the center of Bocas Town, so if you're in Costa Rica and your budget allows, fly! There is no shortage of things to do and Bocas Town makes an excellent base from which to explore. Whether you stay on Isla Colon or one of the outer islands such as Isla Bastimentos, Isla Carineros, or Isla Solarte, there is something fun and interesting to do for however many days you're staying. If you love diving or have been wanting to get an Open Water Certificate, you've come to the right place. Diving the different sites around Bocas del Toro is nothing short of spectacular. On any of the days during your visit you can arrange for classes or a dive trip with either of the PADI 5 Star dive shops in Bocas Town. The dive shops also offer snorkeling that will get you out a bit further than right off the beach. Or check where you're staying for snorkeling gear and where to leisurely get into the water nearby. Starfish Beach is on the outskirts of Isla Colon and an easy ride from Bocas Town. You can arrange transportation from where your staying or in town. The beach here is excellent with its beautiful soft white sand. The gentle surf and crystal clear warm water make it ideal for snorkeling. Visibility for snorkeling is unlimited on most days, and true to its name, there are bright orange starfish everywhere. If you get hungry, walk up the beach to a small area where there are a few kiosks selling food and cold drinks and eat in the shade of trees. We had the freshest ceviche we've ever eaten here! Our accommodations included the use of complimentary kayaks which we took advantage of to explore a calm Saigon Bay. Keep an eye on the weather. Afternoon thunderstorms are common at certain times of the year and out on the water is no place to be in a storm. If where you're staying doesn't have kayaks, there are several rental shops around town that can set you up for a paddle. It might sound strange for a tropical archipelago to have food tours, but by food tours we mean the best kind of food - chocolate! Locals guides can take you on a tour that highlights cacao cultivation and chocolate production, which is quickly becoming one of Panama’s most coveted exports. The tour, run and managed by indigenous Ngabe farmers, gives you a peek into the local native villages where indigenous Ngabe women describe and show the entire process of organic shade-grown cacao, explaining every step of the way including growing, harvesting, fermenting, drying and ultimately roasting and making chocolate. We loved our stay at Koko Acqua Lodge on Saigon Bay, a collection of bright yellow alpine-looking bungalows in a quiet neighborhood. They were very affordable, had kitchens and plenty of room for a small family. Check rates and details. Bocas del Toro Hotel is a comfortable but basic hotel in Bocas town with an excellent restaurant. Check details and rates. The Hummingbird is a small but beautiful boutique eco-B&B on Bluff Beach surrounded by tropical gardens. Think lush jungle lodge in the tropics! Check rates and details. Arrange for transportation to Isla Bastimentos to get to Red Frog Beach. It's about a 10 minute water taxi ride from Bocas Town and then about another 15 minutes on foot. This popular beach with its clean sand and a border of shade trees although small is well worth the $5 fee that's charged for maintenance of the access path (at least that's what the sign says). There are a few places to eat near the beach and get a cold one. But be safe. From November to April there is world-class surf here that can get very rough with riptides being common. This is great if you're into surfing, not so great if you just want to take a leisurely dip. As we said, November to April the surfing in Bastimentos is pretty awesome. There are places nearby to rent a board that will also give lessons for newbies. Other beaches to explore on Bastimentos are Wizard Beach, Turtle Beach, North Beach, Playa Larga, and Cayman Beach. If you're not into surfing or beaching it, try snorkeling the nearby reef. Like many jungle destinations, Bastimentos also has a popular ziplining tour that will take you flying high over the lush canopy near Red Frog Beach. Given the aerial views over these islands, it's not a bad way to add some zip to your day. Spend the day at Isla Bastimentos National Marine Park. If you're feeling intrepid, this is a 45 minute water taxi ride from Bocas Town. But given that the Park covers such a large area including what's probably the best coral reef in the Caribbean, we recommend booking with one of the tour operators serving the Park. You can then tailor your day however you like - hiking, exploring nature trails, beach combing, snorkeling or diving. Red Frog Beach Island Resort is popular for good reason, on the beach and a 5-minute walk to the Bastimentos National Marine Park and Red Frog Beach. Check rates and details. The high end Azul Paradise, gorgeous over-the-water bungalows near Playa Larga, with it's own restaurant and bar. Check rates and availability. The beautiful neighborhood children near Saigon Bay were so sweet and fascinated by my camera. 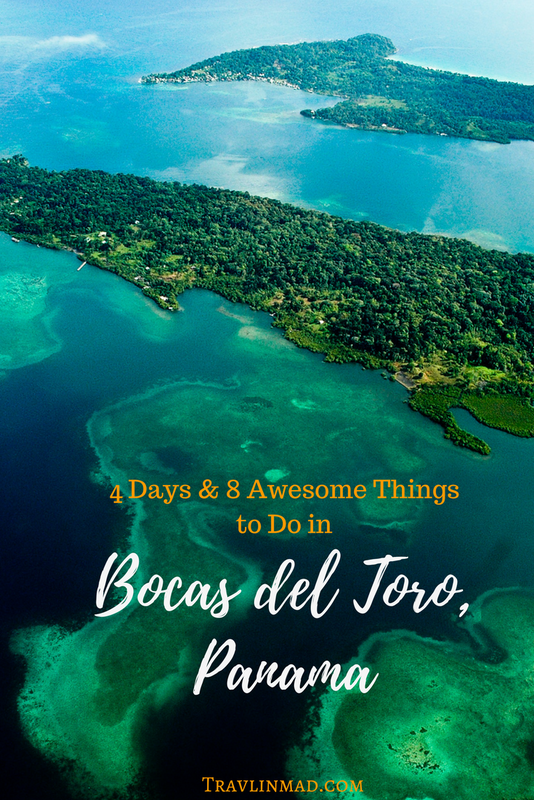 We absolutely loved Bocas del Toro and will visit again, for a much longer stay. Panama takes time to explore and soak in the immense diversity from the landscape to the people. You can follow our itinerary here, find some help with these helpful Central American itineraries, or create your own as you go. Bocas del Toro is the kind of place where you can lose yourself, and time runs together or has no meaning, or something like that. Island time....that's what it is, in the best sense of the phrase. I want to return to that idle state of mind and go even deeper into the sleepy Caribbean where barefoot kids know Bob Marley songs by heart.